Artist Hideki Kuwajima creates whimsical 3-dimensional collages from found children’s toys. Working mostly with neon plastics, the artist achieves amazing symmetry by working in pairs. A given sculpture may include water guns, flutes, bows, or any other assortment of lost novelty items. The result? Amazing eye-candy featuring every color of the rainbow — a piece of art that any child would want to pick apart, toy by toy. Expanding, Kuwajima has also recently been working in crystal stemware. But really, who ‘loses’ their crystal? Artist Hideki Kuwajima creates whimsical 3-dimensional collages from found children's toys. 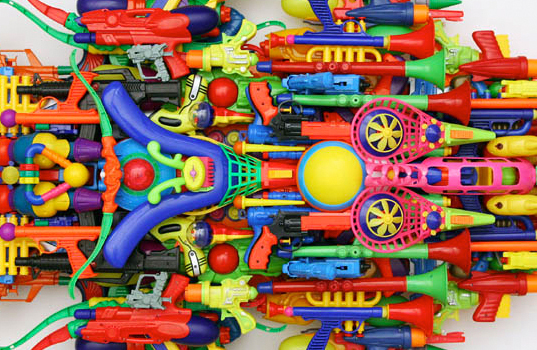 Working mostly with neon plastics, the artist achieves amazing symmetry by working in pairs. A given sculpture may include water guns, flutes, bows, or any other assortment of lost novelty items. The result? Amazing eye-candy featuring every color of the rainbow -- a piece of art that any child would want to pick apart, toy by toy. Expanding, Kuwajima has also recently been working in crystal stemware. But really, who 'loses' their crystal?